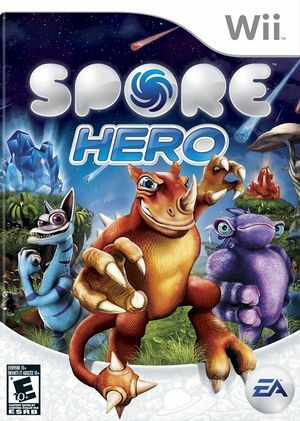 Spore Hero delivers the unparalleled creative freedom of Spore in a story-driven action-adventure game created exclusively for the Nintendo Wii. Set in a rich and vibrant 3D world, Spore Hero empowers you to become the hero as you embark on an epic quest to fight to save your creature's new home world from destruction! This new and original Spore adventure starts with a bang - literally! Hurtling through the galaxy inside a blue meteor, you have just crash landed on a strange alien world. But something evil has followed you and brought dangerous red meteorites crashing down on the unsuspecting planet. Only a true hero can save the world from being destroyed by this new threat! Do you have what it takes to be a Spore hero? In fighting to save your new home planet, your hero will engage in courageous battles, amazing adventures and much more! As you explore your mysterious world, you'll encounter and unlock more than 250 new parts and abilities to help you complete quests, win fights, unlock combos and learn new fighting skills. Creatures will come alive in Spore Hero, thanks to the revolutionary technology known as Spasm. Spasm, also known as procedural animation, is tailored specifically for the Nintendo platform allowing you create any creature your imagination can desire. Want two heads and seven legs, six arms or more? Spore Creature Creator gives you all the tools you need to enhance your hero as you fight, bite, spit and charge your enemies with the Wii Remote. Spore Hero features a dynamic multiplayer mode, where you'll use your battling skills to become the 'baddest' Spore hero around! This mode allows you to create your ultimate warrior by using any combination of your earned parts in a special multiplayer mode Creature Creator, or choose one of your previously created creatures. After editing your creature and saving it the color will become corrupted. Disabling EFB Copies to Texture Only will fix this. It is possible to only disable EFB Copies to Texture Only when saving your creature, and enable it for everything else. Whenever the game autosaves it will run extremely slow until the autosave finishes. There is no known solution. The graph below charts the compatibility with Spore Hero since Dolphin's 2.0 release, listing revisions only where a compatibility change occurred. This page was last edited on 6 December 2016, at 23:22.